South Carolina golf vacations are most likely to exceed your expectations especially golf courses on Hilton Head Island! The Palmetto Hall Plantation located in the Low Country of Hilton Head South Carolina is home to one of the more innovative and unique golf courses in the US. The Robert Cupp Course was designed with the use of computer aids and it demonstrates its heritage by presenting golfers with a combination of unusual shapes and settings. There are straight lines and sharply acute angles vying for dominance and they present all players on South Carolina golf vacations with one of the most challenging courses on any circuit. With all the golf South Carolina has to offer the Robert Cupp Golf Course is top quality. Cupp was chosen as Golf Architect of the Year for 1992 by the editors of Golf World magazine. He has been famous for his ability to transform conventional golf course layouts into advanced, modern designs from the beginning of his career. Of South Carolina golf courses at the Robert Cupp Golf Course players have the flexible tee options available which allows golfers at all levels to enjoy the thrill and excitement of this particular setting. Golf on Hilton Head Island SC at its best! In fact many who golf South Carolina consider this course one of the finest Hilton Head Island has to offer. The large, expansive greens and wide fairways are spectacular to view and enjoyable to play. If you land a shot in the rough its going to be difficult to make it out on one additional stroke. The grounds are smooth and you can count on the balls to roll true on almost all of the 18 holes. With everything South Carolina golf vacations have to offer this inland setting does not have any open ocean views but you will have many carries that stretch over some beautiful marshes. There are abundant woodlands along the course, as well as some beautiful ponds and small lakes which are common in most South Carolina golf courses. Chances are good that you wont even notice the lack of access to the Atlantic Ocean when you begin this round of golf on Hilton Head. Be warned that there are a few blind shots that wait for the unwary golfer. The opening hole is a par 3 that presents players with a marshland view that obscures all possible glimpses of the green. This is just one of the opportunities for you to test your wits and your skills. Oswald Drawdy currently holds the course record of 70 for this par 72 layout. When you golf South Carolina you will find many challenges but none like this! The stark geometric lines of this Hilton Head Island golf course are intriguing to almost every golfer that visits. You will not find the square greens and sharply angled sand traps at any other course in the world much less other South Carolina golf courses. Shapes in the form of trapezoids, hexagons and more can be found scattered among the architectural details. The Robert Cupp Golf Course is known for its pyramid mounds at the 6th hole; these mounds are more than 10 feet tall. This course makes golf on Hilton Head Island very interesting to say the least! If you use the red tees you will play 5220 yards but the blue tees offer a much more challenging 6522 yard course that can be explored on South Carolina golf vacations. If you want to test your skills to the limit, at Hilton Head Golf South Carolina, you can use the gold tees which increases the course length to 7079 total yards. It is not unusual to see a first time golfer tee up to the blue or gold because the generous landings the course provides gives a slight advantage to every player. 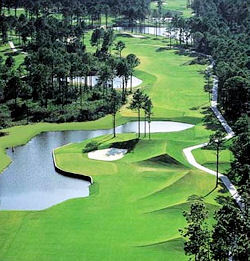 The Robert Cupp Golf Course at Palmetto Hall Plantation is a public Hilton Head Island golf course. The residents of the community all have membership in the club. The clubhouse has both fine dining and casual settings available and there is a Pro shop that can handle almost any request you have regarding clothing, supplies or equipment for your game of golf on Hilton Head. You will come away feeling South Carolina Golf vacations are the best! Visit Robert Cupp Golf Course at Palmetto Hall website.